The classic American favorite, the cheeseburger, tastes even better when grilled. 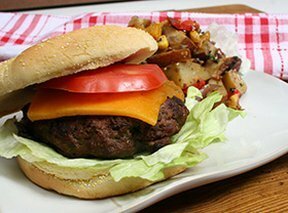 This recipe combines a few simple ingredients to make juicy grilled cheeseburgers that everyone will love. It is sure to be a favorite at your Labor Day backyard barbecue. Let us show you everything you will need to deep-fry a whole turkey and provide you with a step-by-step guide on how to fry it safely. Learn what types of wood can be used safely for grilling and smoking, and which woods are unsafe to use. You can also find out the effect they have on the flavor of foods.